It was the last year of the Vietnam War. Gas was 38 cents a gallon. The Watergate scandal was in full swing and the song Bad, Bad Leroy Brown was dominating the radio. It was 1973. And while all of this was happening throughout the country, the Machinists were putting in place a first contract at Vance Air Force Base in Enid, OK. Fast forward about 44 years and that contract is still delivering to this day. “Whether it’s in 1973 or in 2017, our message remains the same. 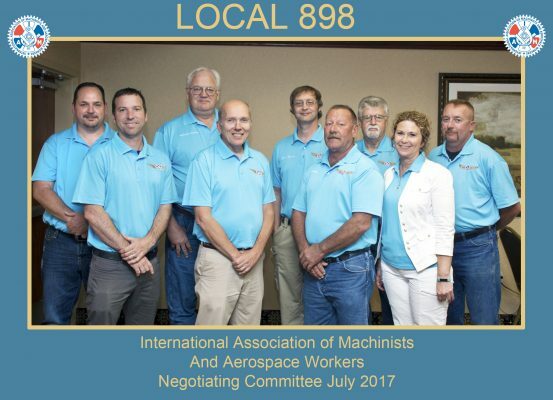 A voice on the job, good wages, strong pensions, defined work rules…these are still the dominating forces of a Machinist contract. And every person in the IAM should be proud that we have been able to deliver that product for more than four decades at Vance AFB. That is exactly why we use the phrase in the South, ‘This is Why I Am Union.’ We are honored to be able to take care of our members with a great Union contract,” said Southern Territory General Vice President Mark A. Blondin. The contract covers about 260 IAM Members who work for ASRC Communications, Ltd. and InDyne, Inc., doing the work that keeps the base up and running. Ultimately helping to facilitate our military Brothers and Sisters in the field. The men and women gathered at the bargaining table with the companies weren’t asking for that much, just a fair contract. Specifically, their requests were leaning more pensions than wages. And since many at the table on both sides have been here before, everyone seemed to understand the importance of a secure retirement for these folks. The value of a pension becomes even more significant after realizing that you are changing the future for the men and women who hold Machinists’ cards. Over the three year contract, the increases amount to about 30 cents per year. But the big pictures tell the full story of what that means. “It’s a huge amount of money. To be exact, at the end of the three years, it’s an extra $484.74 per month for each member. That’s something you can’t explain in dollars and cents. That’s a game changer for many retirees,” said Ben Moody, Organizer and Business Representative for District Lodge 171. It’s become a sort of mantra for Blondin and his team in the South. The IAM Pension is always a win for workers.